South Korean Prime Minister Lee Nak-yon on Monday called for Seoul and Tokyo to look to the wisdom of past leaders to improve bilateral relations. Lee made the remarks at a meeting with a group of Japanese politicians that included Hideo Watanabe, acting head of a Japanese parliamentary committee on cooperation with South Korea. 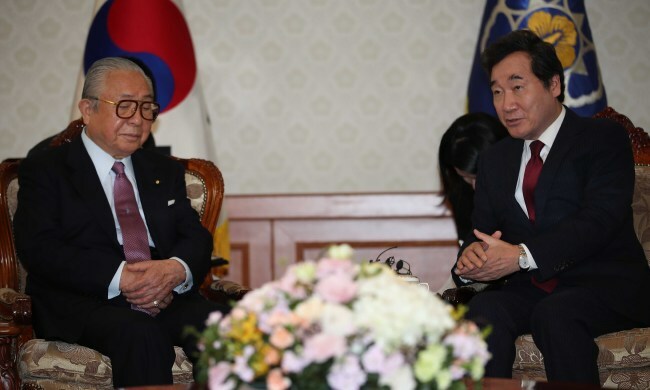 Lee told the meeting that relations between South Korea and Japan reached a high point in 1998, when the then South Korean president, Kim Dae-jung, and Keizo Obuchi, the Japanese prime minister at the time, signed an agreement that called for the two nations to build a future-oriented relationship. “Although there are many difficult issues between Korea and Japan, they need to look back on the wisdom of past leaders,” Lee told the meeting. Diplomatic ties between South Korea and Japan have been frayed due to a series of history-related issues, including the matter of Korean girls and women who were forced to work in Japan‘s front-line brothels during World War II.